Mother’s Day is a celebration honoring mothers and celebrating motherhood, maternal bonds and the influence of mothers in society. It is celebrated on various days in many parts of the world, in Australia and USA it is the 2nd Sunday in May. Today I am combining Reasons to Be Cheerful with my celebration of Mothers. 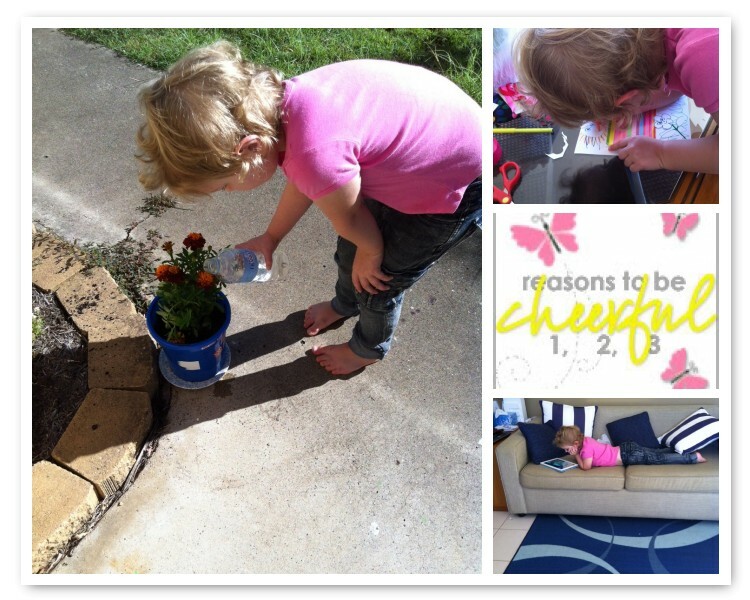 This is my R2BC (week 2 for me) – A beautiful Miss 4 and I worked together on a Mothers Day project for her mum. At the end there was still time to be a iGeneration kid and get in some iPad time. I love the mother of my children, because she is the most kind, giving, patient, loving & selfless person i know, and is always there to pick them up when they fall with a cuddle, comfort them when they have a bad dream, be their nurse when they are sick and give them unconditional love everyday. ‘My Mum is an amazing woman. She is the kindest person I know (rivalled only by Pa). Ma would give you the clothes of her back if you asked her for them, I have actually seen her take the shoes of her feet & give them to a homeless person who had none and then travel the two hours home barefoot on the train. She has been at every school play, sporting event & special occasion in my life. MeMa has gone without essentials for herself many times so that she could give my Brother, Sister & I everything that we ever wanted or needed. Every day when we got home from school there would be a baked treat of some type for us, a loving hug & kind words asking how our day was. Like I say an amazing woman who is always there for me. you departed several years ago now, yet your influence lingers on in my life, in my actions, in my heart. I always say the greatest gift you gave me was when you told me, just days before your death, that whatever makes me happy will make you happy. I believe you now know what my greatest gift to you has been. We both know we spent many years unhappy with each other, yet I do not live with regret. Nor do you. We talked about it, how those years made us grow, and become better women, so that with a few years ahead of us we could look through the mess, see what caused it, recognise neither of us was at fault, smile and leave it behind. Those last years, months, weeks, day and even hours shine brightly as treasures in my life. I love you mum. what a great mother you are. I see how much time and energy, and planning and organising you dedicate to this special role you have chosen, and I am in awe. I know you are gifted and talented in many ways, however the stitches of motherhood that you daily sew are creating the finest quilt of your life. I know you are busy, I know it is a demanding role, I know you must get tired. I know you know it is worth it. Enjoy your special day. In your kitchen you take basic ingredients, and sometimes not so basic, and create nutritional delights and treats for your family. I see you do the same with your children. I watch you create for them rich and yet traditional experiences of a garden and chickens, home and family. I know you also are busy, I know it is a demanding role, I know you must get tired. I know you know it is worth it. Enjoy your special day. Yes you are like a sister is meant to be. However you have been ‘a mother’ in my life. If mothers teach, guide, listen, are always there. If they diagnose illness (yes even in the middle of the night) if they rejoice in one’s achievements, and hold your hand while you weep, and a bucket when you throw up; if they are there for you in sorrow and joy, bring bribes for medical staff, and food with no capsicum in it, then surely your qualify. Thank you. Happy Mothers Day. Tammy – our newest Team Writer shared these lovely memories of her mother Amy Linda Lamb, February 27, 1953 to April 22, 2005. I am often asked where my inspiration for what I do comes from. My answer is quite simple, my mother. A quiet woman, her gentleness often mistaken for weakness. It was her quiet strength that encouraged me to always follow my dreams. It was the fact after raising three crazy kids she decided to go back to school and follow her own dreams. It was having her comfort us as she battled cancer. I remember as a small child she would sit in the living room, that mom had daddy paint sunshine yellow, of our tiny house in a big arm chair and read. I remember crawling into her lap to listen to her read to me. It was there that my love reading, learning, writing became embodied in me. It was those trips to the library downtown that I remember as well as stopping for a Nutty Butty, Coca-Cola and bait to go fishing with daddy. I remember clinging to her hand as went down the steep stairs in the old library to the children’s section for story time or to pick out new books to read. I remember discussing why pollution was bad and what acid rain was. Mom and I shared secrets, all of them mine as she kept her own counsel. We discussed everything and anything, we argued, we did almost everything together. So many of my memories involve my mother, crafts we did together, stupid fights (as a teenager I couldn’t stand the fact that she was right), long talks late into the night and curling up with mom to watch a movie even as a grown woman with children of my own. I am not sure how she managed it throughout her life but she always found the positive in a situation. I took her love and trust for granted, she was steadfast and always there with open arms. She was a Jewish mother so there was more than bit of guilt from time to time but there was never a doubt that she loved me and my brothers. She knew our strengths and weaknesses, loved us and encouraged us to follow our hearts and dreams. She taught me to bake, can and craft. She taught me to look beyond myself to see how I could make the world a better place. My mother gave me the confidence and self reliance that is now seeing me through my darkest moments. Mom taught me to be independent and strong, yet it took me years to realize that she did so through example. Her kindness often seen as weakness when it was really her strength. My mother had the strength of her convictions, a strength she has passed on to me. It is to her I owe my own strength. It is my true hope and dream that my children will also have her strength of conviction, her strength and her gentleness. If I could spend even one more moment with her it would to be to tell her again how much I love her and to thank her for all that she gave me and all that she still gives me each day. I will always be inspired to do more, love more and to cherish every moment. Every day is truly a gift not meant to be squandered living in the past but to be seen as a step into the future that grows ever brighter. If you are alone today, if you are sad or sorrowing, please call a friend and talk. Or go for a walk, or visit the elderly or sick. It will help. And tomorrow will be better. I never realized that the day in the UK, in the US and in France were all different for Mothers Day – either way its an important day and I hope everyone enjoyed it! Yes, when I was living in the UK and my mum in the US I basically had to send her cards twice a year! It would be easier if such days were international. Bit like The Queen having areal birthday and a fake one. Now that has to be annoying.